To clean the tiles I used a strong dilution of Tile Doctor Pro-Clean which was left to soak into the Slate for a good ten minutes before working it in with a buffing machine fitted with a black scrubbing pad. 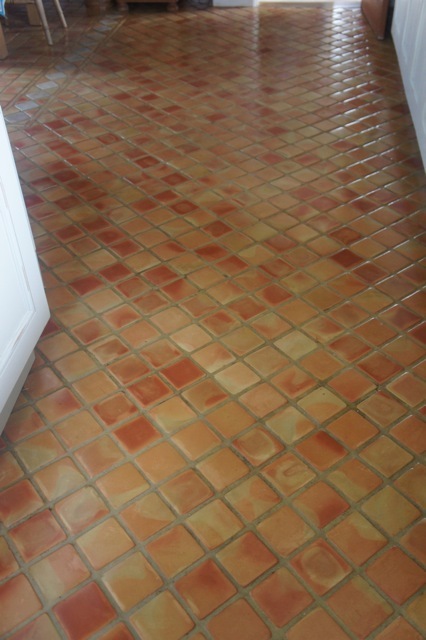 This action removed the ground in dirt and any old sealer and a stiff brush was then run along the grout lines with more Pro-Clean to get them as clean as possible. 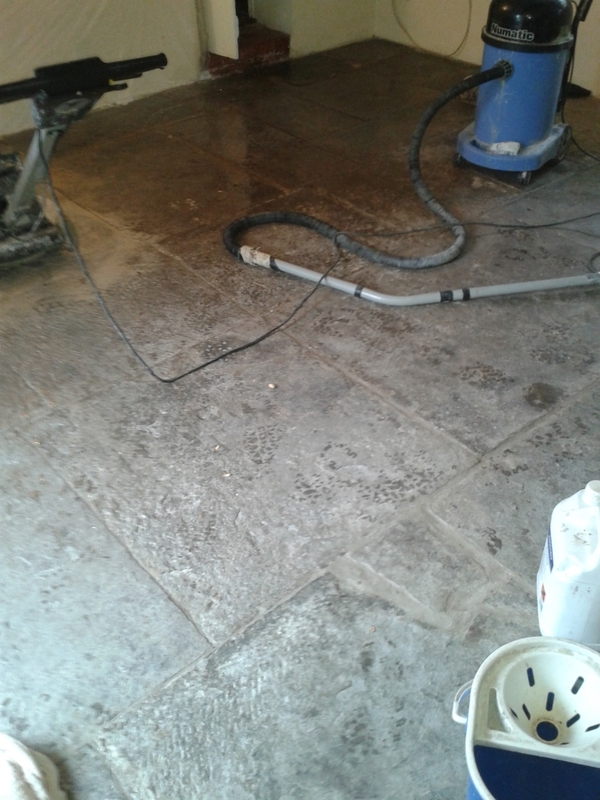 The floor was then rinsed thoroughly and any stubborn areas retreated; a wet vacuum was used to extract the soiled water from the surface of the stone in order to get it as dry as possible. The floor was left to dry overnight and I returned the next day to seal using three coats of Tile Doctor Seal and Go sealer which is a water based sealer (so no smell) that leaves a nice subtle shine to floor. 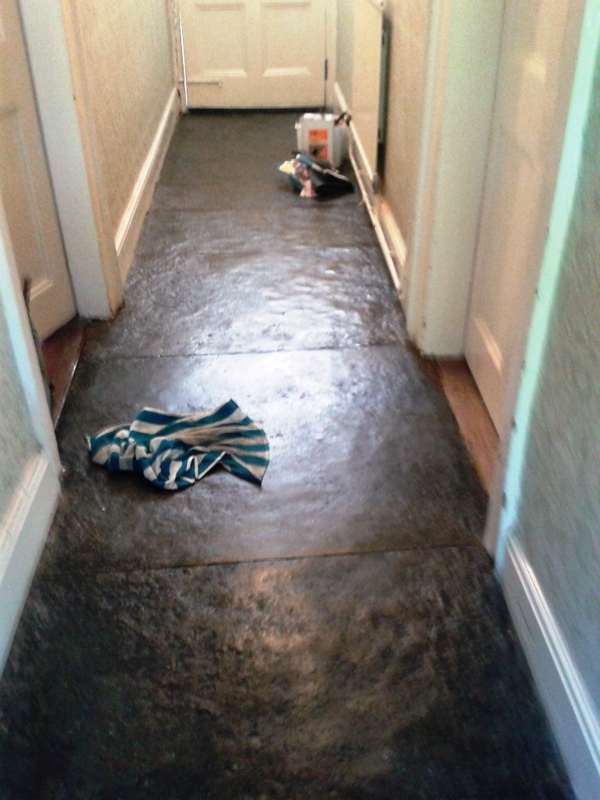 The slate and the grout looked really dull and dirty before we started and now the floor looks like it was recently laid. 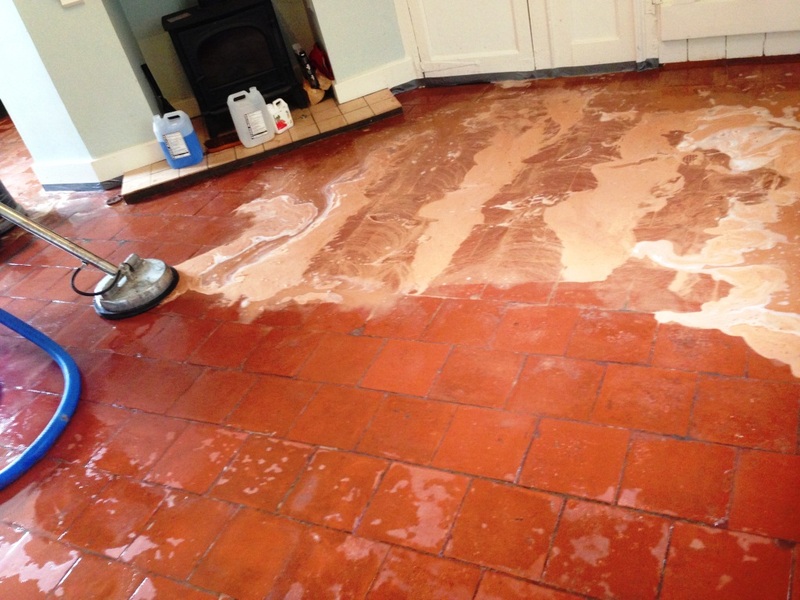 For aftercare we don’t recommend the use of a Floor Steamer as they work on a 100 degrees and this damages the sealer; for regular cleaning use Tile Doctor Ph Neutral Cleaner using a two bucket system, whereby you apply the cleaning solution with a jug, wipe the floor and then squeeze off the excess into the second bucket, this stops you reapplying dirty water onto a clean floor..
Every now and again, I get a call from a client located on the small peninsula of Sandbanks, Poole. Sandbanks, sometimes referred to as ‘Britain’s Palm Beach’, is known for its fantastic beach and high value property. My client asked me to take a look at a Travertine floor in his kitchen which was, in fact, more highly polished than he had wanted. The polished finish had worn off the travertine tiles where they had been walked on, leaving a dull trackway running down the centre of the kitchen. With its distinct characteristics, travertine is a popular choice for kitchen flooring, although it is also quite often used in bathrooms. 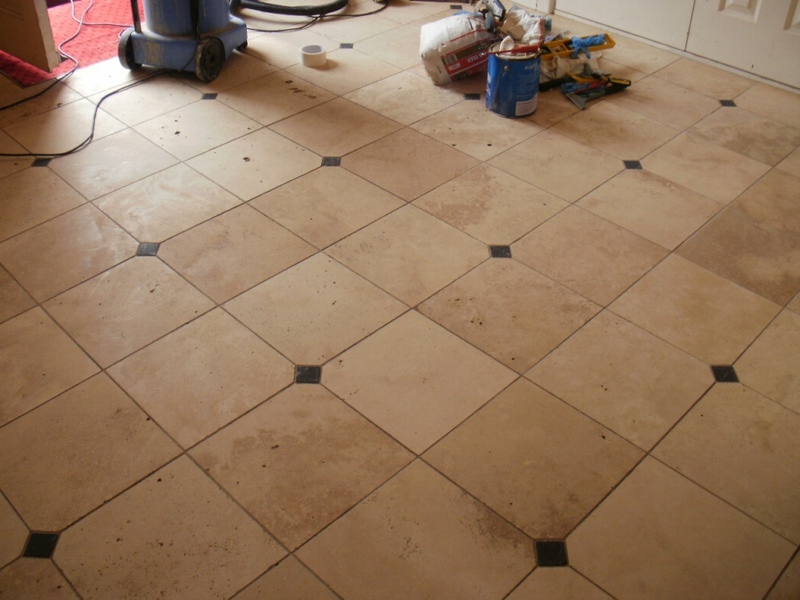 In any case Travertine tiles will need regular maintenance to keep them looking their best. Unfortunately, the kitchen floor must have experienced some sort of settlement or shrinkage as a long crack has appeared, which ran along the same line as the dull trackway. 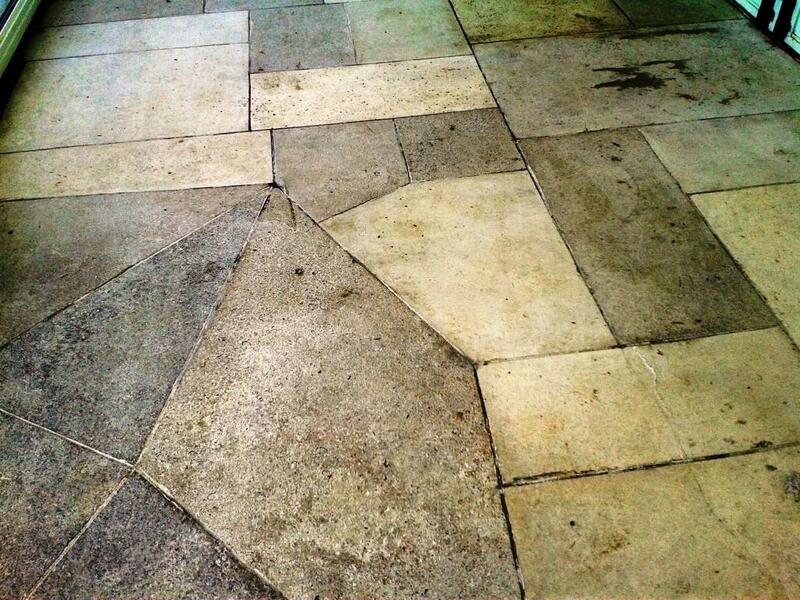 It is not uncommon for Travertine tiles to crack due to wear over time, or even bad fitting in some cases. 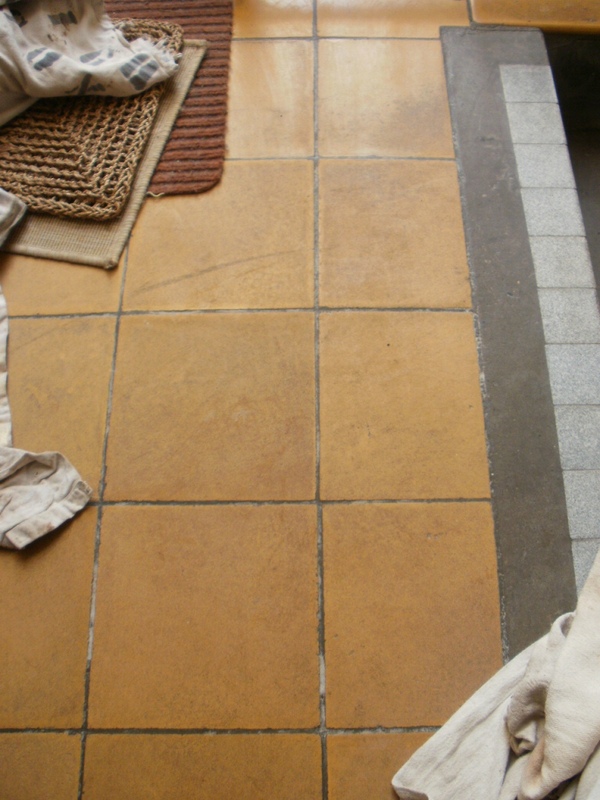 While the exact cause of the crack was unclear, the homeowner concluded that the floor was certainly in need of restoration. 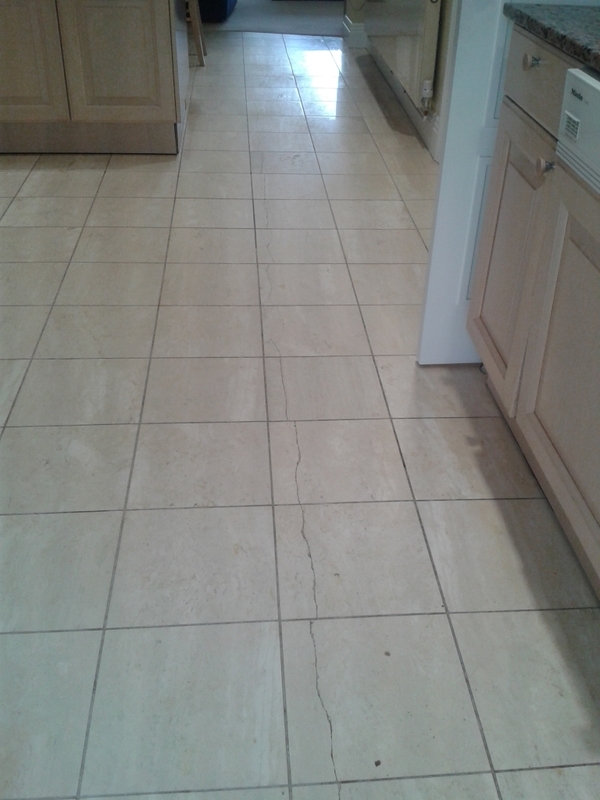 Replacing the Travertine tiles was not an option due to a lack of spare tiles, so I opted instead to fill the crack in the floor using Harbro Stone Filler, an epoxy stone filler, matching the colour of the tile as closely as possible. I left this to set, before sanding down the excess filler. 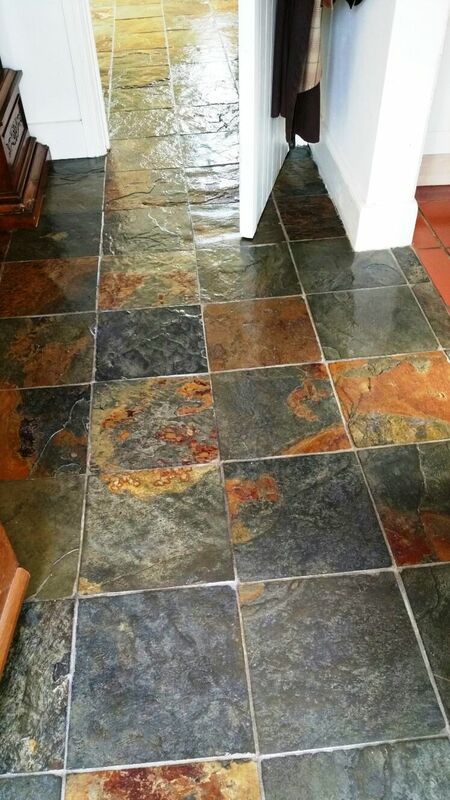 My next action was to use a set of Tile Doctor Diamond burnishing pads to sand out any scratches and restore a more even shine to the floor, as per the client’s request. For polished stone, I recommend using a set of four burnishing pads applied in order: Coarse, Medium, Fine, and Very Fine. I used these one after the other with a little water to lubricate and restore the surface polish to the desired level. 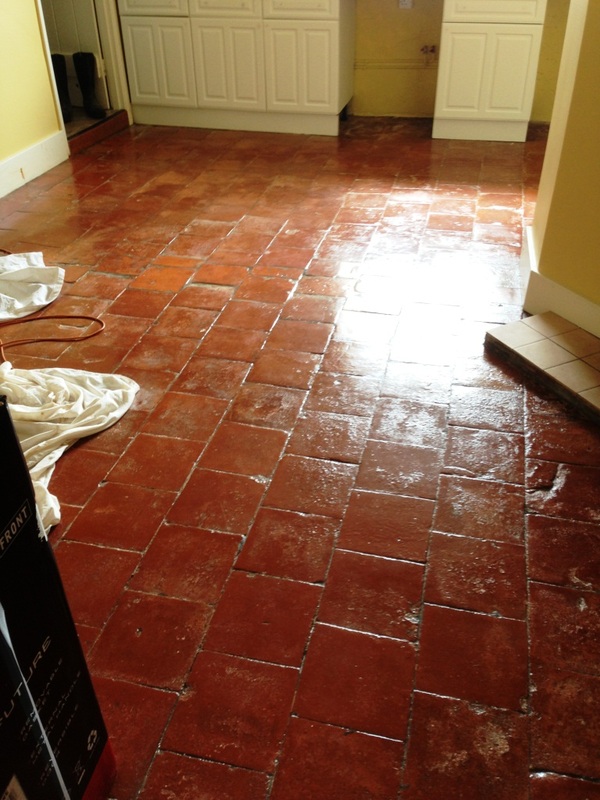 The next day, I returned to seal the floor with a couple of coats of Tile Doctor Colour Grow sealer. Colour Grow is a colour enhancing, impregnating sealer which penetrates deeply into the pores of the stone, thereby preventing dirt from becoming ingrained within. 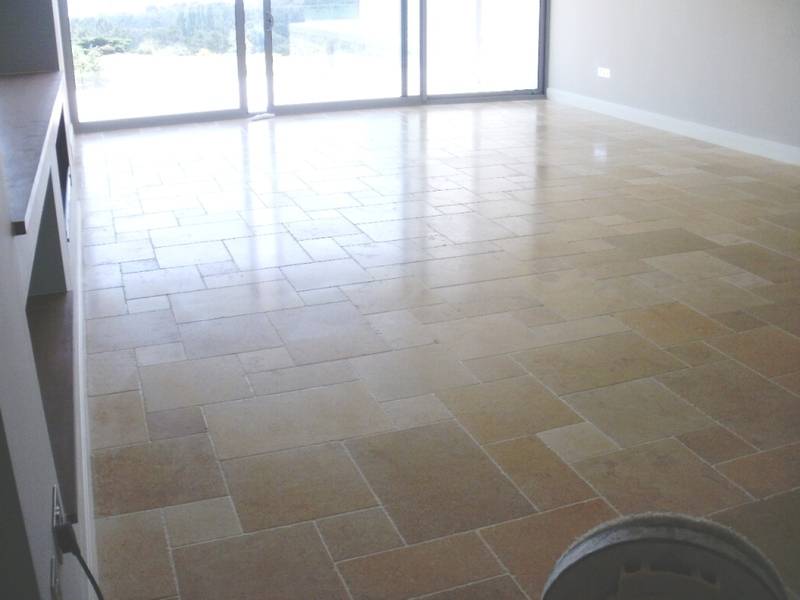 This particular sealer also enhances the natural colours within the Travertine tile, whilst also providing long term durable protection. Although the crack could not be made to disappear completely, its appearance was much improved. 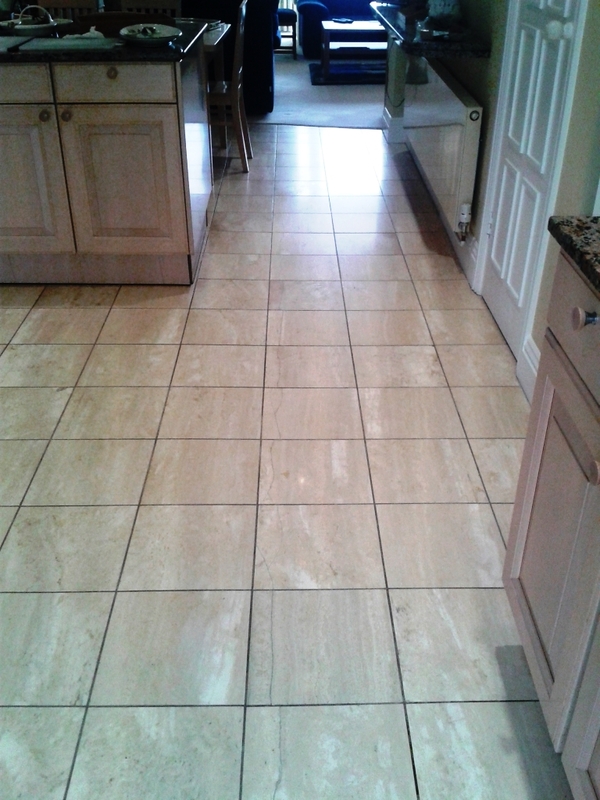 The customer was also very pleased with the long-lasting lower sheen provided, describing it as “the finish I had wanted in the first place when the tiles were fitted”. 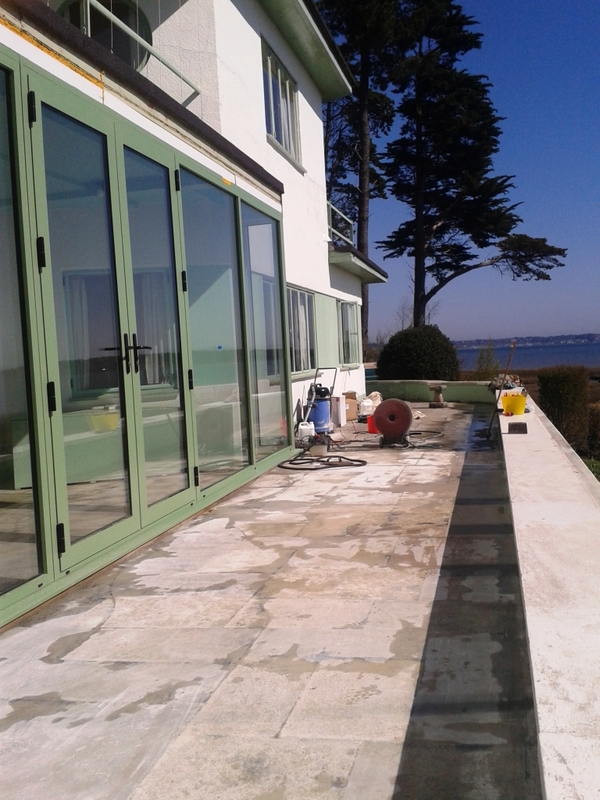 This Portland Limestone patio on Round Island in Poole Harbour had, together with a sun room indoors, been covered in a thick layer of carpet glue which had set hard in the warm sun over the years and the owner had found it impossible to remove themselves. There’s no bridge so the island is serviced via a boat from the mainland, which as you can imagine made it a bit of a task getting all my equipment over there. I began by using 17″ Starke Silicone carbide discs which at 24 grit are much coarser that the burnishing pads we usually use. To get the right level of traction I used the disks on a Numatic buffing machine that had been weighted down and the combination worked well to cut through the glue and turn as much as possible of it to dust. To remove the remaining glue I soaked the Limestone in a dilution of Tile Doctor Remove and Go and left on the glue overnight under sheets of plastic and dust sheets so it wouldn’t dry out it. It also ensures the product remains in contact with the glue and kept it away from any wildlife which might use the patio when I wasn’t there. The next day the remaining glue had softened and I removed as much as I could using a black buffing pad attached to the buffing machine together with a strong dilution of Tile Doctor Pro-Clean before applying more Remove and Go again and steaming each tile in turn whilst brushing with a brass coated Spid wire brush. This was quite a lot of work and as the stone was not dense and had wide pores the glue had sunk in deep when it was applied and I had to repeat this process several times before the stone was clean. Finally I used a pressure washer to thoroughly rinse and clean the stone before re-pointing where necessary. Apologies in advance for the quality of the photographs below, they were taken in the sitting room of an old 18th century cottage near Weymouth and the lighting was not its best, although I’m sure fans of the TV series Poldark would have loved it. 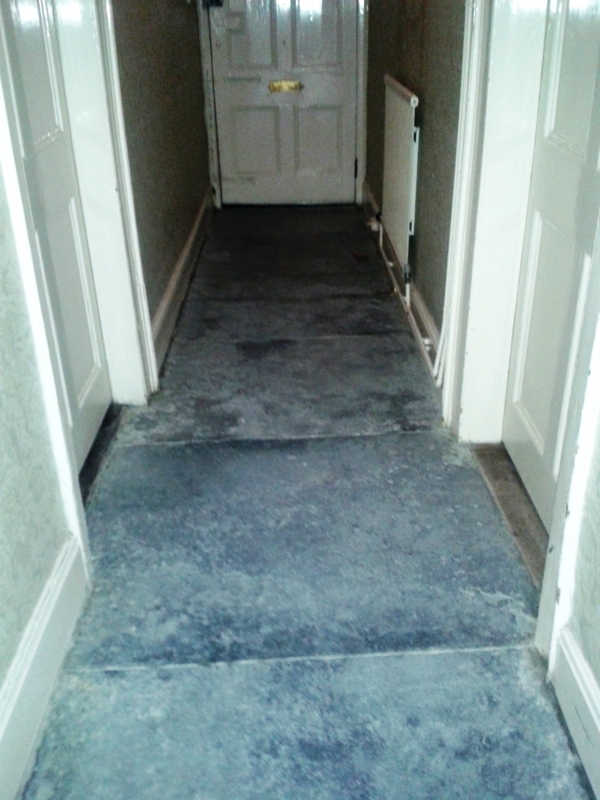 The floor was 20m2 Portland Limestone flags which hopefully you can see was not looking its best and I suspect it had been some time before it had been given a thorough deep clean as it was now grey, grimy and generally tired. 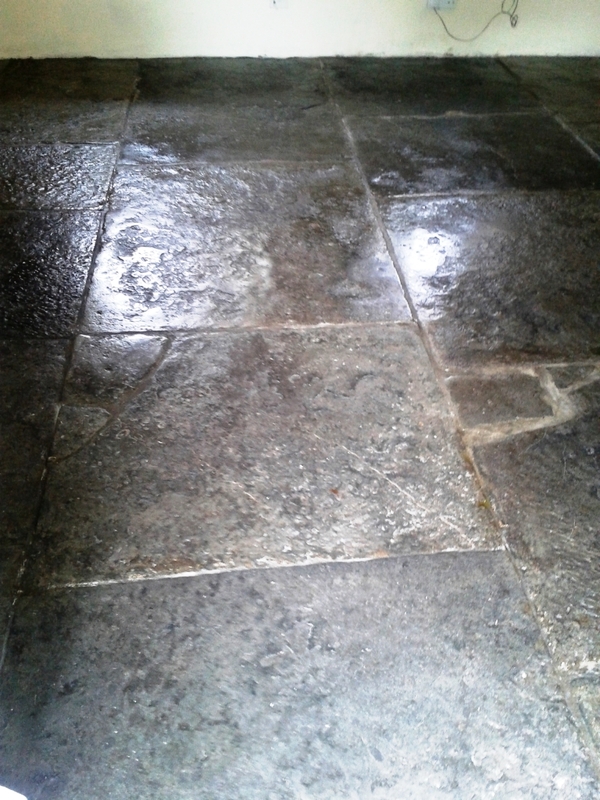 This type of floor is quite common in houses before the 19th century and usually consisted of the beaten earth being covered with thick slabs of stone. When left over time it becomes grey and dry and flaky but when cleaned and sealed it turns almost as black as its near relative Purbeck marble and even shines when polished. 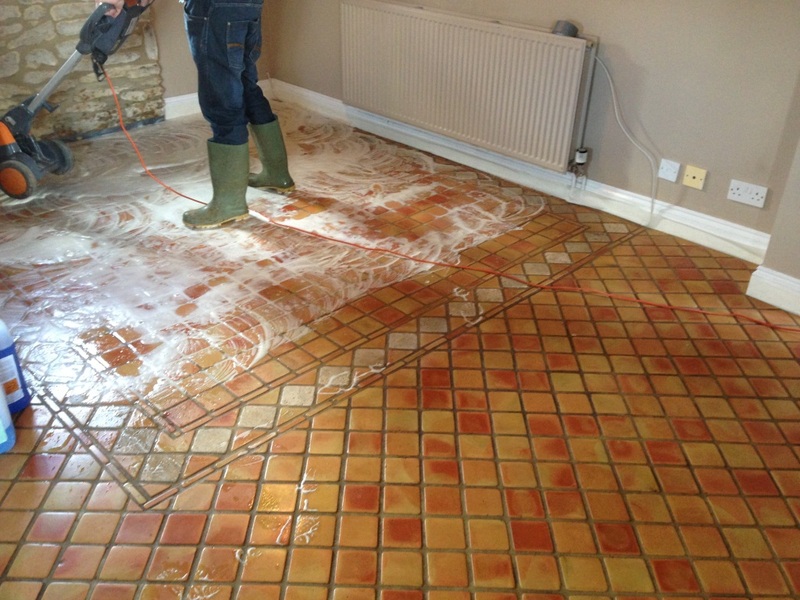 To get the floor clean I applied a medium dilution of Tile Doctor Pro-Clean which was left to soak into the floor for about ten minutes before being scrubbed in with a black scrubbing pad fitted to a Numatic buffing machine. 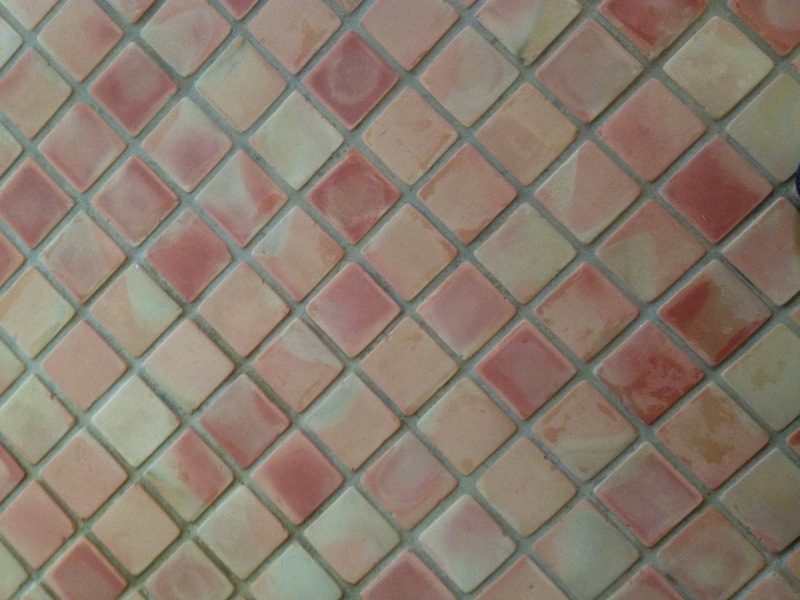 I also ran a stiff narrow brush along the grout lines to get them clean. The floor was rinsed down with water to dilute the now soiled cleaning solution and this was extracted using a wet vacuum. 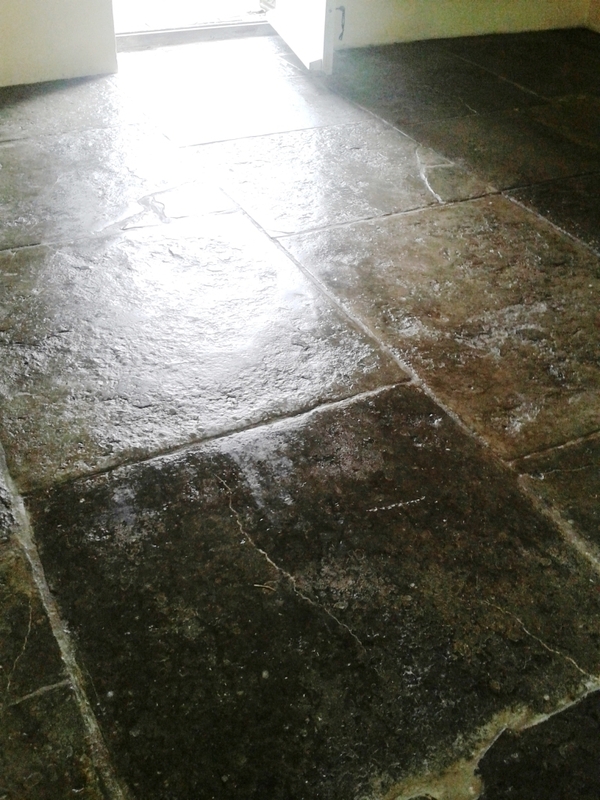 To add a little polish to the Limestone I ran over the stone using a fine diamond encrusted burnishing pad, the floor was still a little damp which helped lubricate the process. Once done the floor was given another rinse again using the wet vacuum to remove as much liquids as possible before leaving it to dry off fully overnight. The next day I sealed the floor using two coats of Tile Doctor Colour Grow sealer which impregnates the pores of the stone to provide lasting protection. The floor now looks clean and bright and a lot closer to the near-black colour that it should be. This Georgian house in the beautiful historic town of Sherbourne, Dorset still had its original floor of black limestone flagstones. 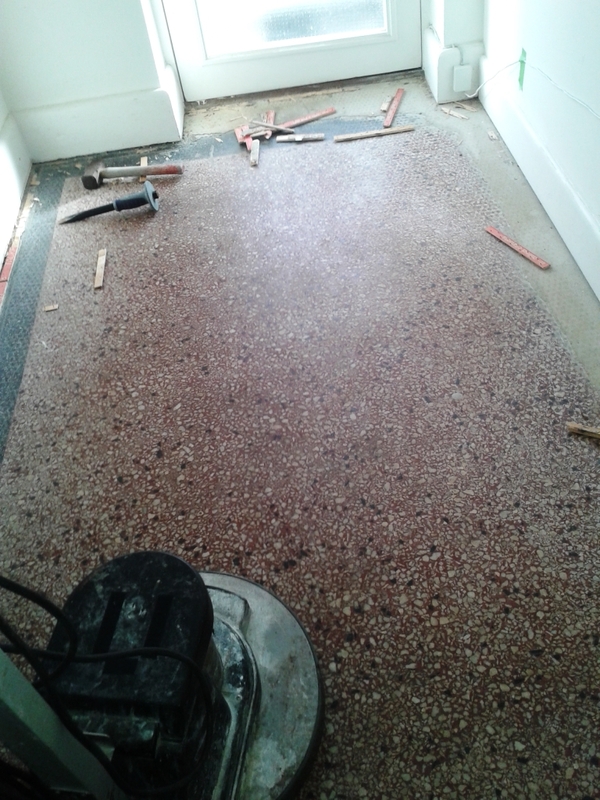 These were in a sorry condition, having been smoothed over with a cement screed to make it level for a carpet and, before that, painted at various times with both red and green floor paint. A combination of cement, hardened carpet glue and old floor paints all needed to be completely removed before I could even begin to clean the original stone beneath. After chipping away the areas of cement with a chisel I used an application of Tile Doctor Remove and Go which was left to soak into the stone for a while in order to loosen the old floor paint before steaming and wire-brushing the entire floor. 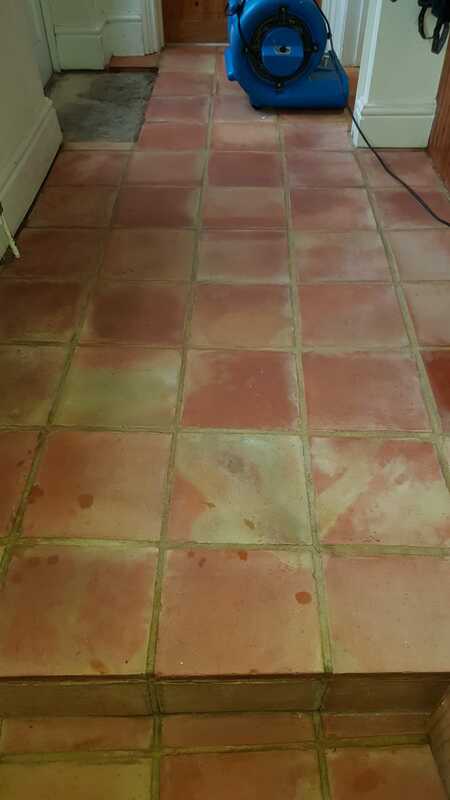 This I followed with an application of Tile Doctor “Pro Clean” scrubbed in with a black buffing pad under fitted to a Numatic buffing machine to further clean the slabs. Next step was to cut back and re-polish the Limestone flagstone using of a set of diamond encrusted burnishing pads fitted to a rotary machine. You start with a coarse pad with a little water, then a medium pad, fine pad and finish with a very fine polishing pad rinsing the floor between each pad. 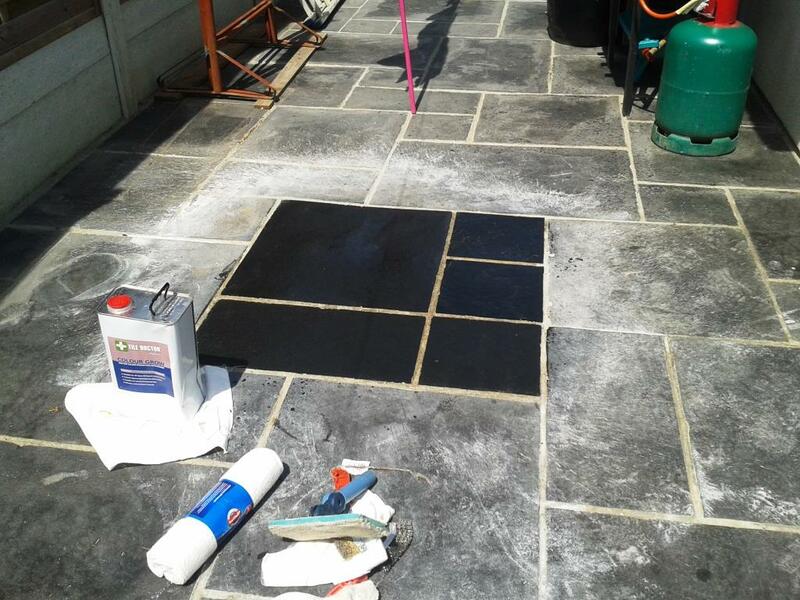 Following all this treatment the flagstones needed a few days to thoroughly dry out after which I returned to seal them with Tile Doctor “Colour Grow”, a long lasting impregnating sealer which enhanced the natural colour of the tiles and turned them from a drab grey to a rich and shining black. 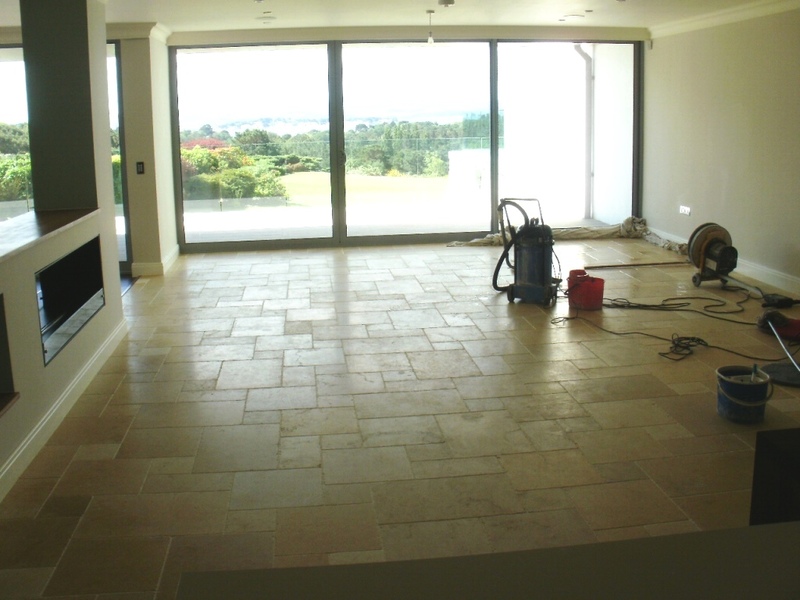 Slightly unusual job this one involving a Limestone tiled floor at a house in Canford Cliffs which is a beautiful part of Dorset near Poole overlooking the sea. 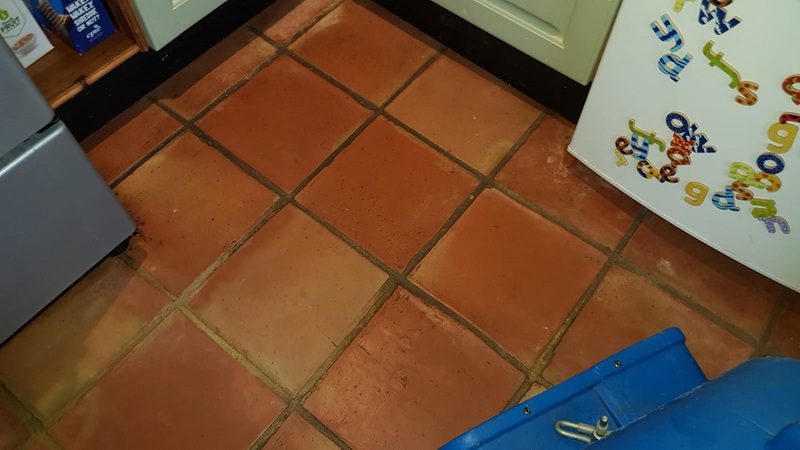 The tiles had only recently been laid and then sealed by a tiler, unfortunately however too much sealer had been applied and it had been allowed to dry on the surface of the tiles causing a smeared and messy appearance. 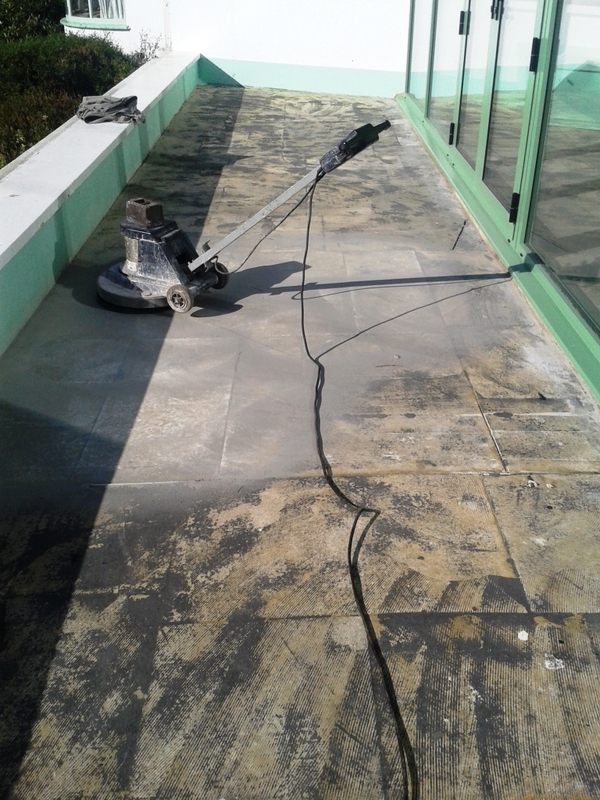 To remove the sealer from the floor the surface needs to be cut back and re-polished using of a set of diamond encrusted burnishing pads fitted to a rotary machine. You start with a coarse pad with a little water, then a medium pad, fine pad and finish with a very fine polishing pad, this takes some time but the effect it quite transforming, it does build up slurry on the floor so it all needs to be rinsed down using water and a wet vacuum to remove the liquids the wet vacuum also helps to get the floor dry. 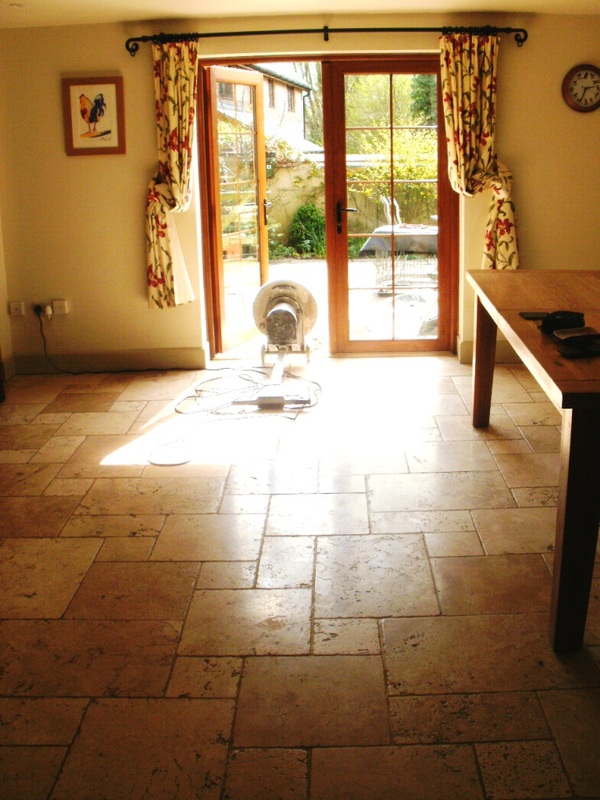 The floor was left to fully dry overnight and I returned the next day to seal the Limestone tiles using a coat of Tile Doctor Colour Grow carefully applied using a B&Q paint pad. Colour Grow is an impregnating sealer that fills the pores in the Limestone to prevent other contaminates staining the stone; it’s also a colour enhancing sealer that lifts the natural colours in the Limestone. Once dry the floor was buffed using a Numatic buffing machine fitted with a soft white pad to give a perfect finish to the floor. 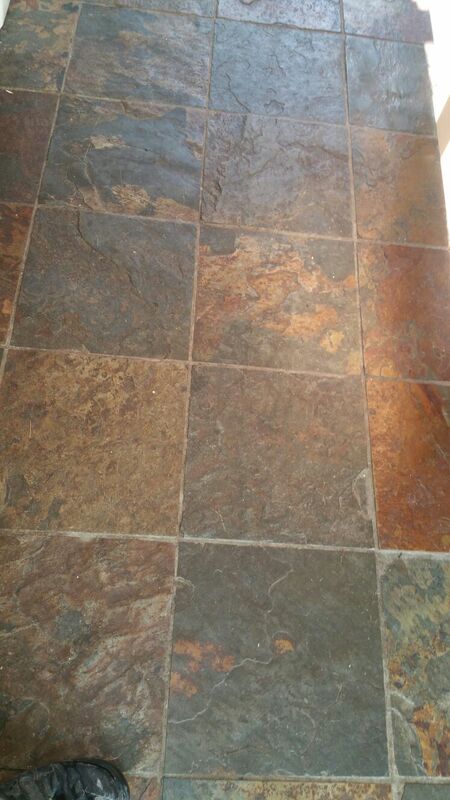 The floor is now looking as it should and the customer was delighted with the result, needless to say the tiler was very relieved. 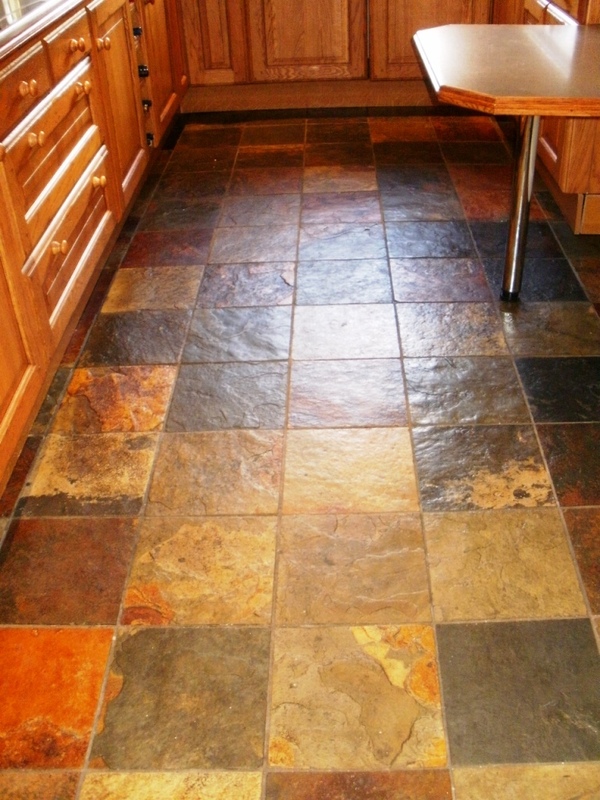 This Shell Slate tiled floor was installed in the kitchen of a house in Lytchett Minster and had not been sealed after its installation over twenty years ago and had now become deeply ingrained with dirt which the owner could not remove however hard she tried. 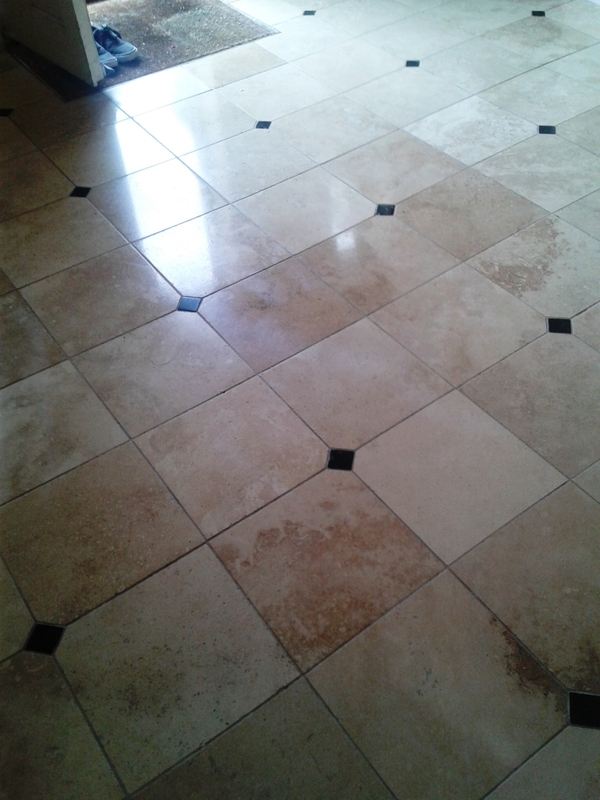 To clean the tiles I used Tile Doctor Pro-Clean diluted one part cleaner to five parts water, the solution was applied it to the floor and then left to soak in for ten minutes before working it in with a Numatic buffing machine fitted with 17″ medium firm brush. Next the tiles were steamed using an Earlex steamer and stubborn stains cleaned by hand using sections from a cut-up black buffing pad and a Spid brass-coated wire brush where necessary. 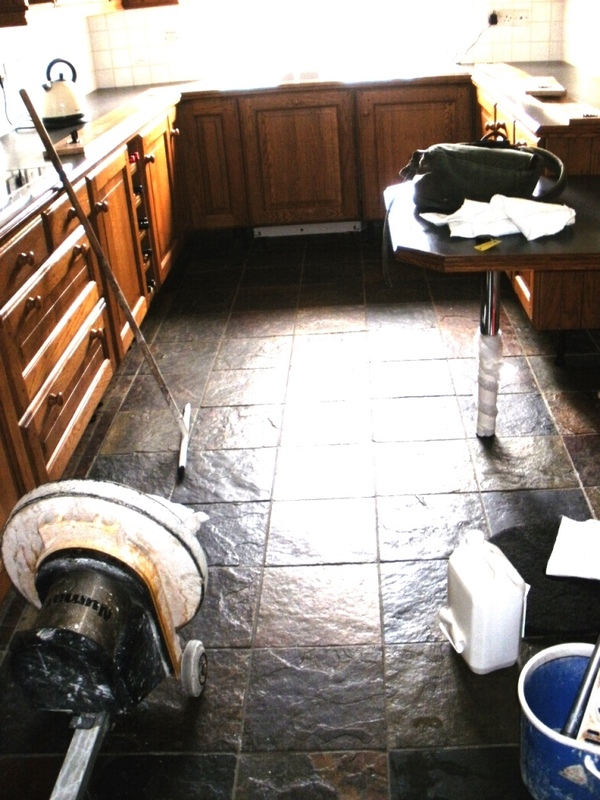 Being riven slate the floor was too uneven to successfully clean using a black buffing pad fitted to a rotary machine as the sunken parts of the tile would have been missed and so cleaning tile by tile was the only option to ensure the slate was returned to the best possible condition. A stiff brush was also run along the grout lines before thoroughly rinsing the floor to remove any trace of cleaning product. The floor was left to dry overnight and I returned the next day to seal using two coats of Tile Doctor Colour Grow sealer which is a penetrating sealer that occupies the pores in the tile preventing contaminates from lodging there and enhances the many beautiful colours of the Slate as well as leaving a subtle shine to floor. 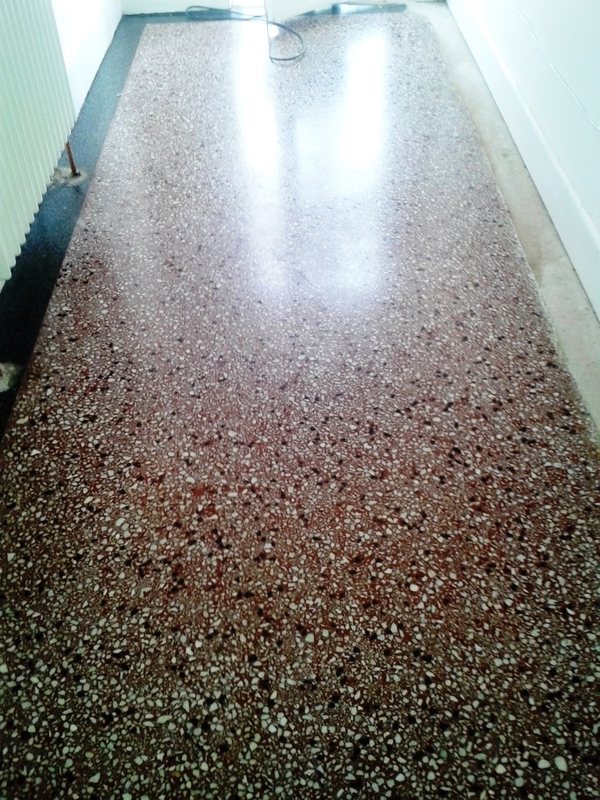 The customer was very pleased with the result and said that she hadn’t before seen the true colour of her floor. Occasionally I get a call to pop down to Sandbanks on the Dorset Coast which is well known for containing the most expensive property in the UK outside of London. 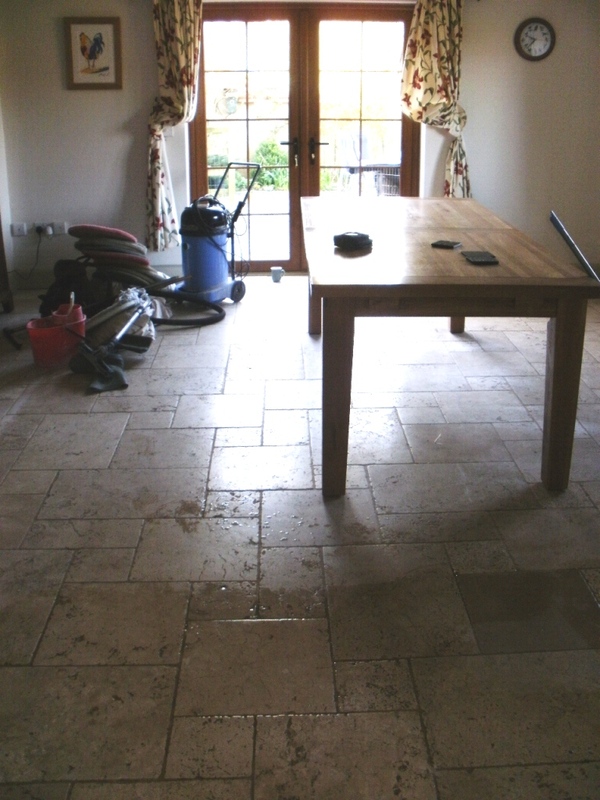 This particular residence had a Travertine tiled hallway which was badly in need of renovation, it had become very soiled and dirt had become trapped in holes that has opened up in the stone over time and now needed cleaning and filling. 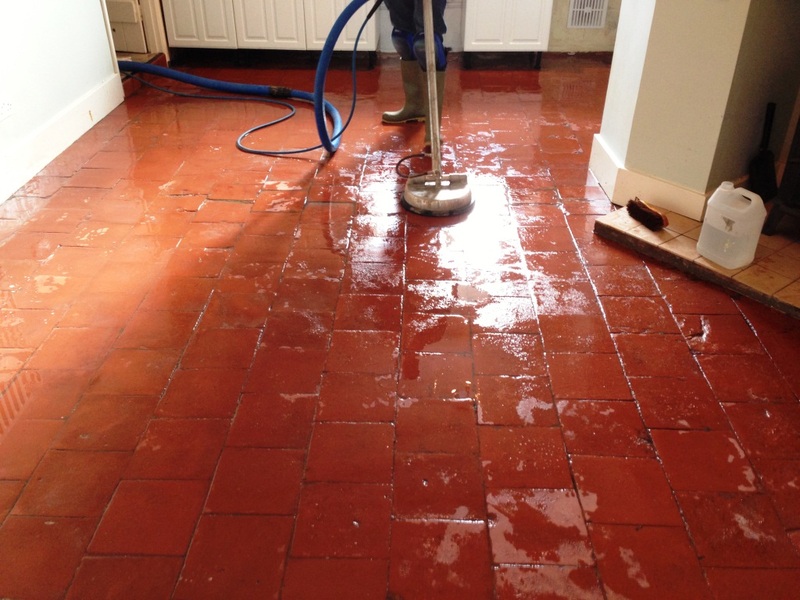 I began by applying a dilution of Tile Doctor Pro-Clean which was left to soak into the floor for ten minutes before being worked into the tile and grout using a Numatic buffing machine fitted with a medium brush. I then dried the floor using a hot air gun and filled the holes with Harbro Stone Filler which is an epoxy filler as hard as the stone itself. I carefully scraped off the excess filler before leaving it to set overnight. 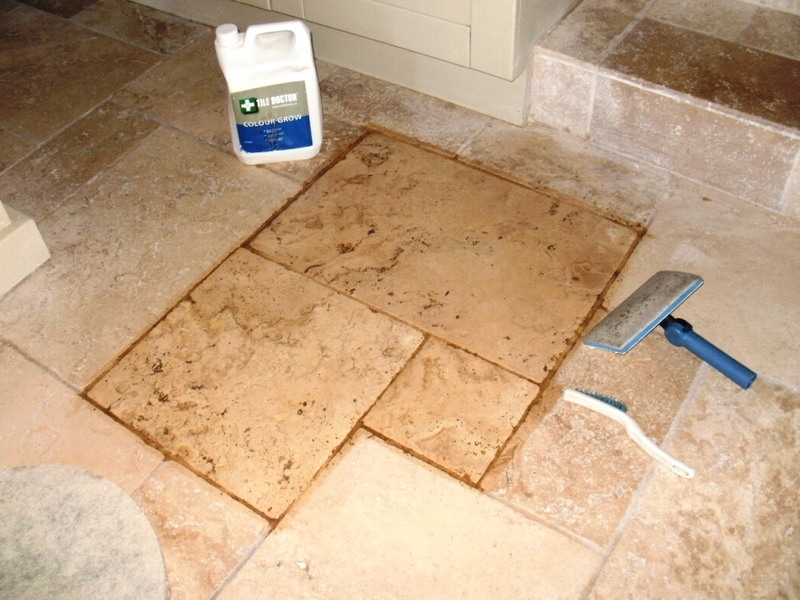 The next day I used 17″ wet and dry paper to remove the excess filler and to cut out some of the deep scratches in the travertine. 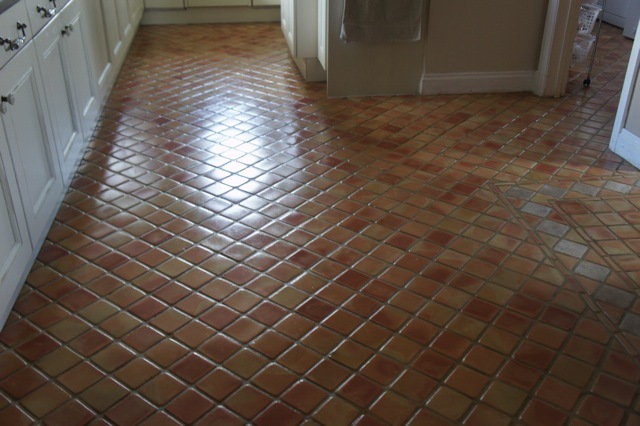 This I followed by honing and polishing the floor using Tile Doctor burnishing pads which are diamond encrusted and come in a setup of four pads which are applied one after the other from Coarse, Medium, Fine and then Super Fine to restore the surface polish. Unfortunately I didn’t remember to take a photo of the floor until after the initial clean but the effect of the filling and burnishing pad treatment should be visible. This Quarry tiled floor in Milton Abbas, Dorset was over 200 years old and had suffered from various attempts at maintenance over the years. 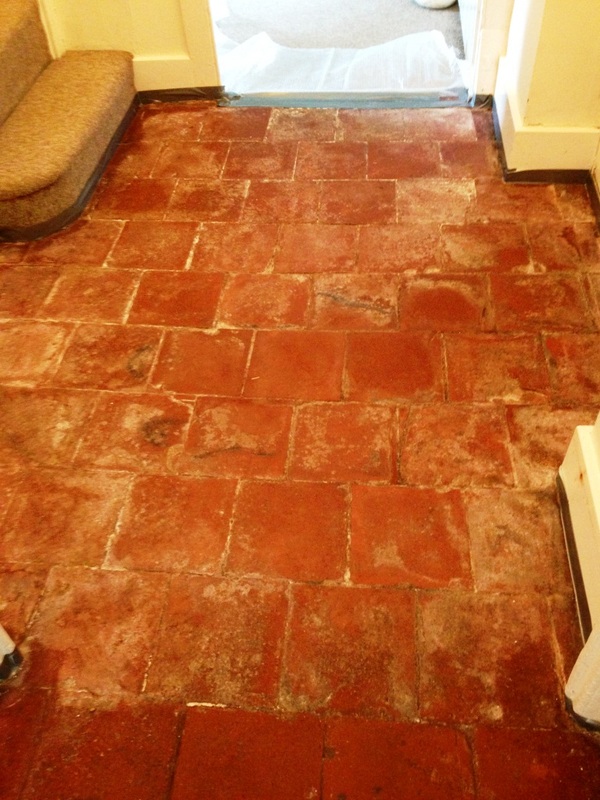 Built at a time before the invention of damp proof membranes there was evidence of efflorescence where damp had risen up through the floor and deposited salts on the tile surface leaving white staining. Tile Doctor Grout Clean-Up was applied to remove the Efflorescence, it’s an Acid based product more commonly used for the removal of grout from the tile surface but also just as handy for the removal of mineral deposits, rust stains as well as efflorescence; I should warn that you can’t leave the product on the tile surface for too long as being an Acid it can damage the tile so it needs to be washed off with clean water soon afterwards. 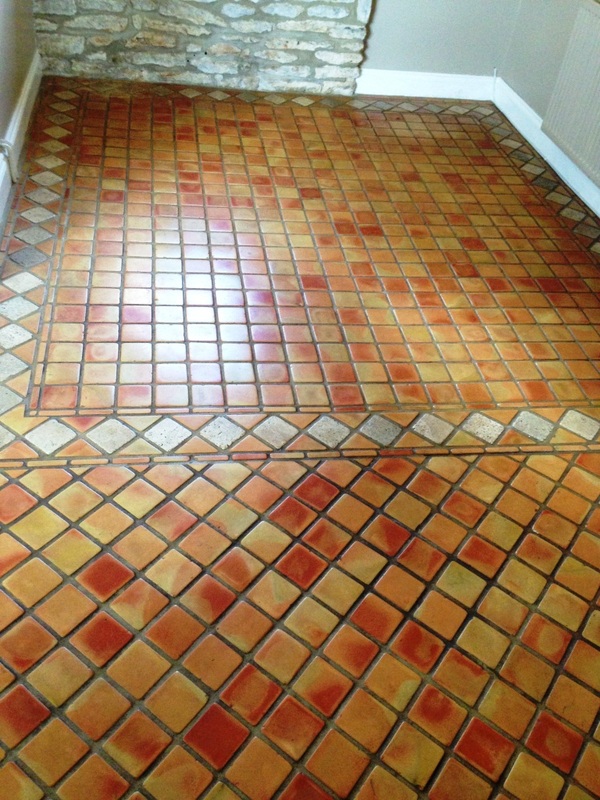 Once we had tackled the efflorescence problem we set about cleaning and neutralising the floor using a dilution of Tile Doctor Pro-Clean mixed 50/50 with NanoTech Ultra Clean which adds nano sized abrasive particles to the solution to make a more effective cleaner. We allowed this to dwell for a short while before agitating it with a rotary machine fitted with a black scrubbing pad working the solution into the floor. Once we were happy with floor it was washed down with a high pressure spinning tool which is a special floor cleaning machine. Once clean the dirty solution was removed using a Vet Vacuum and then left to dry. 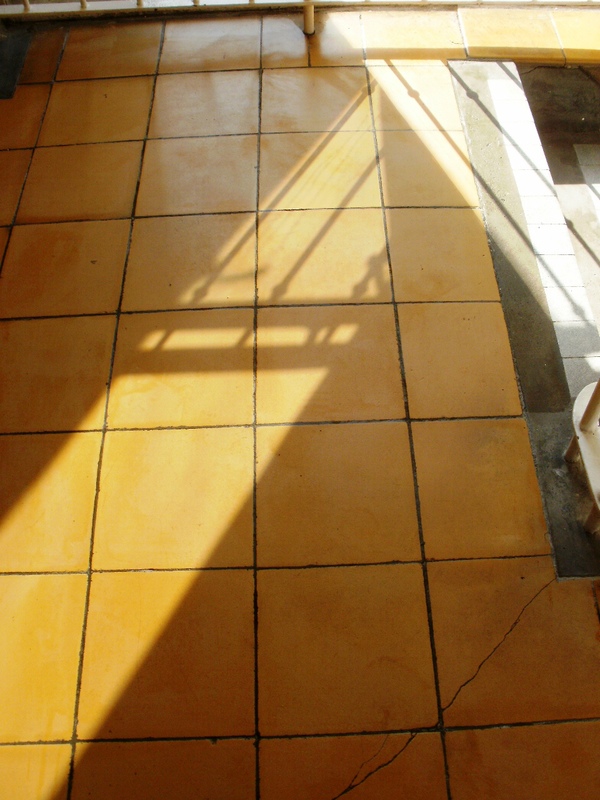 When the floor was dry we applied Tile Doctor Seal and Go which is a specially formulated water-based blended sealer ideal for Quarry tiles that provides both a stain resistant surface seal with a durable low-sheen finish, six coats were required to completely seal the floor. I think you will agree the floor has been transformed and given a new lease of life. Great job, Stuart worked hard to put our floor right and removed stains that we thought were impossible to remove. Limestone floor now looks great after the new sealer was applied. Once upon a time a wife became sad because her slate tiles had become very dull.Husband in despair searched the net and found Charles,The Tile Doctor and promptly arranged a visit. He arrived like a ray of sunshine, charming,funny and very efficient. That evening husband was waiting for his meal, but wife was late. He found her sitting in the kitchen “What are you doing” he said. “Oh husband I have fallen in love” she replied. “With Charles” husband cried. “No silly” she said “With my lovely gleaming colourful tiles,I am so happy”. Alleluia” replied the husband “but what time is supper?. The End. Thank you Charles. GB & GJ. Stuart was very helpful when he came and advised us honestly on the level of work we needed. The two men that came out to complete the work were friendly, courteous and very pleasant to have around. They worked incredibly hard all day and completed the work to an excellent standard. We will definitely be using the company again and would be very happy to recommend them to others. A great improvement on our rather tired looking bathroom. The technician worked diligently with minimal breaks. A friendly and professional service, promptly carried out. The first visit to assess the job and give an estimate was made by Charles and a date for work to be done was agreed at the same time. Stuart arrived on time and carried out the job thoroughly and with enthusiasm and clearly took a pride in his work. 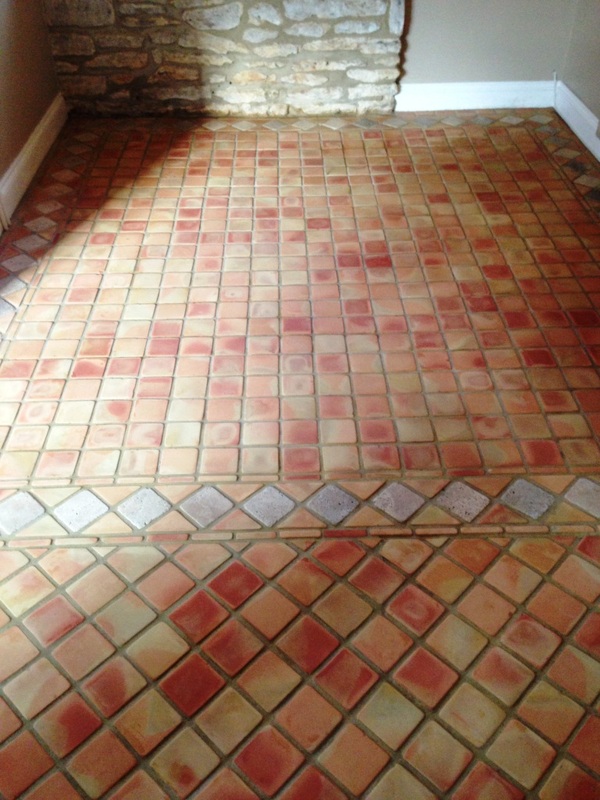 The result is very satisfactory and we have already recommended Tile Doctor to a neighbour.